Environmental chambers evaluate product quality and reliability and identify manufacturing flaws and weaknesses in those products before they are released to the general market. Environmental chambers replicate normal and extreme conditions of temperature, humidity, pressure, and altitude in machines specific to each condition, or a combination of conditions. 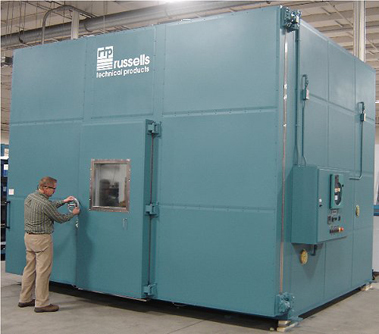 Due to the vast range of product sizes, test chambers can range from simple, smaller benchtop test chambers to the larger, more complex walk-in test chambers, and even drive-in chambers for vehicles and aircraft. Other environmental conditions that can be tested in chambers include the effects of vibrations, dust and sand, salt spray, and vacuums. The validity of environmental test results is important as it is these results that future product modifications and improvements are based upon. Therefore, design and construction of the environmental chamber must be carefully considered in terms of size, existing conditions, and variations in products and location. The consistency with which an environmental test is performed is crucial to the reliability of the results, therefore it is wise to refrain from including unnecessary man-made interference with the process to keep it as uniform as possible. Industries which use environmental testing include automotive, engineering, construction, medical, pharmaceutical, food processing, packaging, and consumer. Everyday products such as car parts, cigarettes, makeup, medicines, and kitchen appliances undergo testing by manufacturers to ensure their durability and effectiveness in certain environmental conditions. For example, car parts can be tested in different levels of humidity and salt spray to check corrosion-resistance, medicines can be tested in temperature chambers to determine optimum storage temperature, or kitchen appliances can be evaluated in response to extended periods of vibration. If faults or flaws are revealed during the testing process, manufacturers can then adjust the product accordingly and retest it. Once a product is approved, it can be released to the public market confidently. Consumer safety and satisfaction are imperative to the success of any business, and so environmental testing, while a costly and time-consuming exercise is a worthwhile investment for manufacturers to undertake. Adequate testing and modifications will ensure that reimbursements for warranties will be reduced, thus saving the manufacturer in the long-term. Environmental chamber testing results in a better quality, more durable product. Environmental Chambers Environmental chambers reproduce environmental conditions within a contained space for the purposes of evaluating the long-term effects of specific changes upon objects such as industrial products, electronic products, and other components.